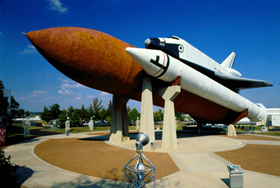 The National Aeronautics and Space Administration (NASA) has been an integral part of Huntsville and Madison County. Founded in 1958, NASA first became a presence in the state in 1960, when it established the Marshall Space Flight Center (MSFC) at Redstone Arsenal in Huntsville. German researcher Wernher von Braun, who was the U.S. Army's lead rocket engineer at Redstone, led NASA's rocketry program from 1960 to 1970 as the United States made monumental strides forward in its quest to explore space. NASA diversified the scope of its research at MSFC beyond rocket propulsion in the 1970s and 1980s and developed outreach programs such as Space Camp through its U.S. Space & Rocket Center. Toward the end of the century and into the new millennium, MSFC has been involved with the launching of the Hubble Space Telescope and development of the International Space Station.